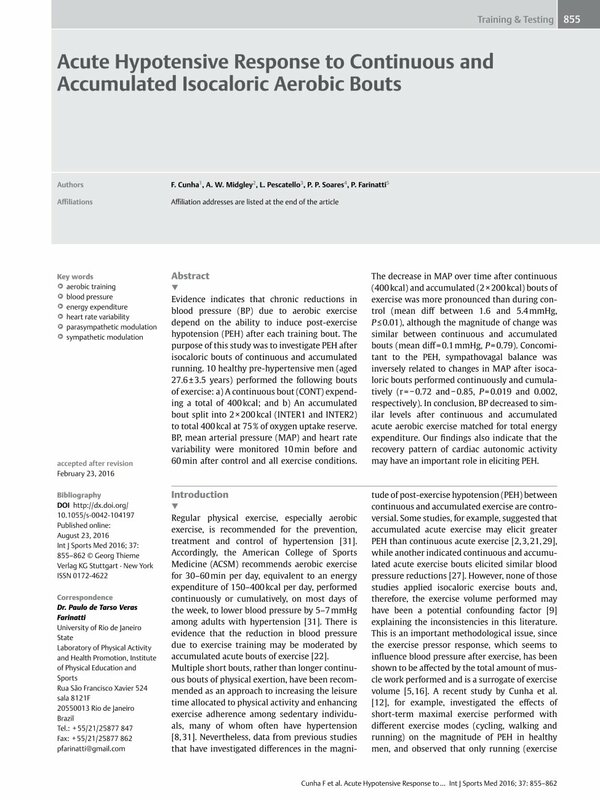 Evidence indicates that chronic reductions in blood pressure (BP) due to aerobic exercise depend on the ability to induce post-exercise hypotension (PEH) after each training bout. The purpose of this study was to investigate PEH after isocaloric bouts of continuous and accumulated running. 10 healthy pre-hypertensive men (aged 27.6±3.5 years) performed the following bouts of exercise: a) A continuous bout (CONT) expending a total of 400 kcal; and b) An accumulated bout split into 2×200 kcal (INTER1 and INTER2) to total 400 kcal at 75% of oxygen uptake reserve. BP, mean arterial pressure (MAP) and heart rate variability were monitored 10 min before and 60 min after control and all exercise conditions. The decrease in MAP over time after continuous (400 kcal) and accumulated (2×200 kcal) bouts of exercise was more pronounced than during control (mean diff between 1.6 and 5.4 mmHg, P≤0.01), although the magnitude of change was similar between continuous and accumulated bouts (mean diff=0.1 mmHg, P=0.79). Concomitant to the PEH, sympathovagal balance was inversely related to changes in MAP after isocaloric bouts performed continuously and cumulatively (r=− 0.72 and−0.85, P=0.019 and 0.002, respectively). In conclusion, BP decreased to similar levels after continuous and accumulated acute aerobic exercise matched for total energy expenditure. Our findings also indicate that the recovery pattern of cardiac autonomic activity may have an important role in eliciting PEH.